"If you like chocolate, make this cake recipe of a chocolate cake with chocolate filling. You'll love it." Preheat oven to 350 degrees F(175 degrees C). Grease two 9 inch round cake pans. Sift flour, baking powder, salt, baking soda and 1 1/2 cups of the white sugar together in a large mixing bowl. Add 1/2 cup of the shortening and 1-1/4 cup of the evaporated milk. Beat at medium speed with an electric mixer for 2 minutes. Beat in the eggs and beat for 2 minutes longer. Spread the batter evenly into the prepared pans. Drizzle 1 square of the melted chocolate in a spiral on top of each cake. Feather lines with a knife to form a web pattern. Bake at 350 degrees F (175 degrees C) for 30 to 40 minutes or until a toothpick inserted in the center comes out clean. Let cakes cool in pans for 10 minutes then remove from pans and let cakes cool completely. 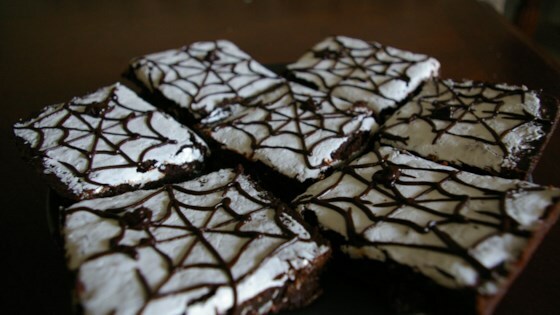 To Make Filling: Combine the 2 squares unsweetened melted chocolate, 1 1/3 cups shortening, 1 cup white sugar, 3/4 cup evaporated milk and the vanilla together and beat with an electric mixer until smooth. To Assemble Cake: Cut each cooled cake layer in half horizontally. Spread 1/4 of the filling between each layer making a 4 layer cake with a web design on top. Frost sides with the remaining filling.